The cruiser USS Lake Erie and destroyer USS Pinckney returned to San Diego on Sunday after separate deployments. The Lake Erie left San Diego in May on an independent deployment and sailed more than 40,000 miles in the western Pacific Ocean, Indian Ocean and Persian Gulf. Navy officials said Lake Erie sailors provided humanitarian assistance in Colombo, Sri Lanka, after severe flooding and landslides devastated many regions of the country and left nearly 10,000 homeless. They also trained with allied navies. The Pinckney was part of a strike group led by the Washington state-based aircraft carrier USS Nimitz. 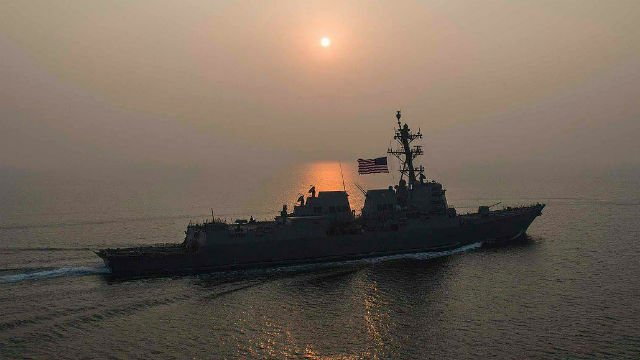 The force also included the San Diego-based cruiser USS Princeton, which arrived home Wednesday, and destroyer USS Howard, which returned Tuesday. He said the crews battled through intense heat in the Persian Gulf to conduct operations against Islamic State targets.